If you are anything like me you burn a lot of things in the pan – because they stick. Non-stick pans are a godsend, and are great for frying eggs, whipping up pancakes on a Saturday morning for the kids or even when frying meat. However, I have always hated using teflon or other non-stick pans because of the chemicals they use (fluoride-based) which can be carcinogenic. Of course, over the years companies have tried to go with less harmful chemicals, but I am still not sold, which is why I always opt for ceramic pans. They are just as good as traditional non-stick pans, but way less harmful. The challenge though, is in choosing one that will last. One where the non-stick stays non-stick, for a year or two at least. Most pans get scratched, dinged or over-cleaned/scrubbed at some point, so I change mine often anyway. But the longer they last the better, right? So, in this post i want to compare some of the best ceramic non-stick pans on the market and see which are worth buying. When buying a ceramic pan there are a few things you need to watch out for. 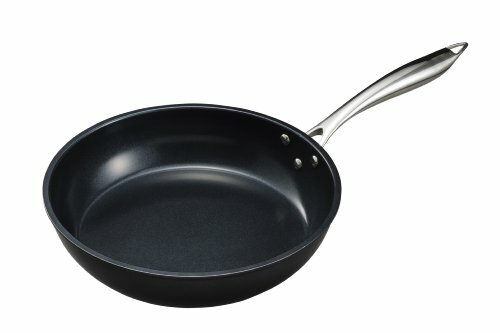 Some of them specific for this type of pan, others related to pans in general. Overall, the pans in this review all contain no PTFE or PFOA. Some are also cadmium free, which is worth knowing. Ceramic pans tend to be very susceptible to high heat, so you have to treat them well and not over heat them to keep the non-stick coating lasting. So, you will see many reviewers complain the coating breaks down, but in most cases it is likely because the pan was overheated. If you need super high heats I recommend a plain old stainless steel pan. The thicker the pan and better the metals and design used in the base, the better the heat distribution. You will see comments in many reviews about how good or bad it is, so be on the lookout for those. And also, if you are using induction, that the pan works with that (I believe they all do, but check, just in case). One of the pans also has a raised middle, which is also not ideal, but might not bother everyone. The handle is usually not a big deal unless you plan on placing the pan in the oven, say, to finish off meats. In that case, be on the lookout for the 2 pans in this review with silicon handles that can survive higher temperatures like 450F. The other handles are all good enough to be used to fry, but might not come out of a hot oven! I have tried to restrict this review to ceramic pans that are worth your time and investigation. Not all of them are “the best” because some of super affordable (which is what some people prefer to the best) but they are all the best selection around. WearEver have produced one of the top-rated pans on Amazon, so I placed this one first. It has a few benefits over most of the pans. First, it’s PTFE-Free, PFOA-Free, and Cadmium-Free, making it a safe alternative to standard non-sticks. It also comes with a glass lid, so it’s easy to stop the oil splattering all over the cook top or to steam something in it’s own heat. Being glass, it also allows you to see what is happening as you cook. The bottom is more or less flat, which is handy, but some reviewers have complained about a slightly raised center (dome) area that makes keeping any liquids in place difficult. It might not be the ideal fried egg pan in that case. Another chemical free (PTFE, PFOA, Cadmium) ceramic pan, this one from Kyocera is another decent option for those wanting a super-flat bottomed pan. 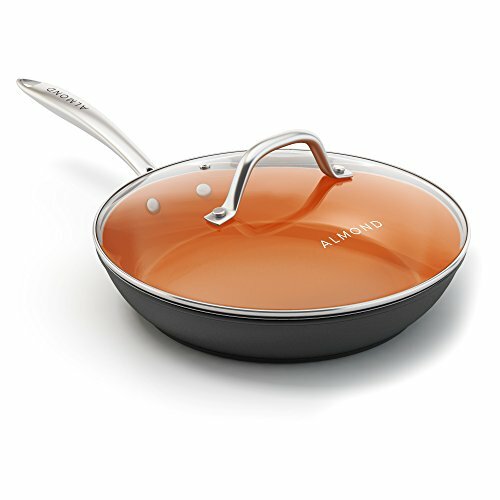 It has higher sides than many pans, which makes it a great combination pan for eggs, pancakes, and even stir fries. However just be aware that it is harder to get a spatular in under things, so flipping pancakes might take a little practice. People have also said in reviews that it is slower to heat up than some pans, but the heat is distributed very well. The non-stick surface also seems to be the longest lasting out of all I have reviewed, with almost every review praising it. Of course, some people don’t treat the pan right, and the coating does not last (more on that in the coating section of this review). 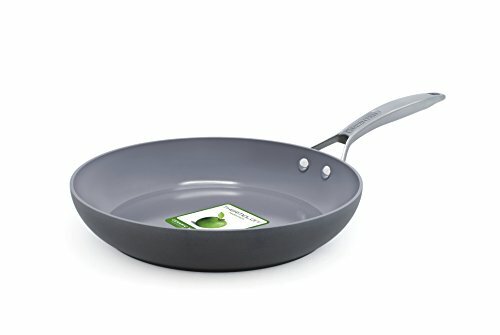 This pan from GreenPan seems a decent buy at first glance, but I found a lot of people say the non-stick surface does not last very long. And given it’s not the cheapest pan in this review, I am not sure I would recommend it. This set of pans has a few advantages over others in this review. First, you get 3 in a set, instead of just one. An 8, 9.5 and 12 inch pan. They are all also designed to work well with induction, if you have that kind of cook top. 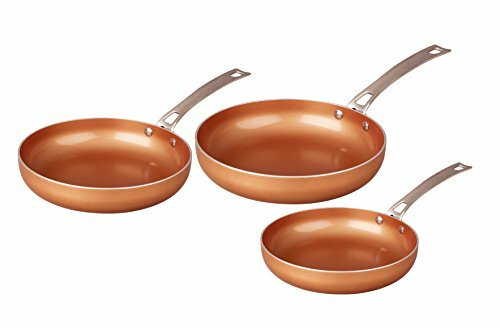 They also get a very high rating on Amazon (4.5 at the time of review) and most reviewers are impressed with how long the non-stick lasts, which is rare for a ceramic pan. They also have stainless steel handles so will do well in the oven teoo. This deep pan with lid is a worthy contender in this list for many reasons. It heats well, has a great non-stick surface and is oven-friendly to 420F. Something many a budding chef will love. I have not been able to find details on how chemical free the coating is though, but the standard seems to be higher than the old school teflon pans I used to use. As with all ceramic pans though, you have to treat this with care to keep the coating going for longer – slow heating up, clean carefully, no metal utensils. Which Ceramic Pan For You? All ceramic pans need to be treat with care, so be careful when reading all the bad reviews about the non-stick not lasting. It might be the product, but in many cases it is because people use too high a heat on them. Having said that, there are a few things to think about when buying one – will you put it in the oven (get the handle that can survive 400+F). What size do you need? And of course how much are you willing to pay. In the end, it is a far better bet than teflon or the standard non-stick, no matter which pan you buy.